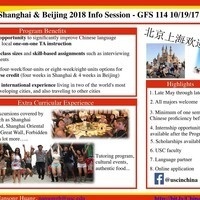 The info session for the 2018 USC Shanghai & Beijing will be held next Thursday, 10/19 at 1:00 - 1:50pm in GFS 114. All are welcome to attend! During the meeting, we'll give you all information, including scholarship info. If you can't make it, please visit http://bit.ly/ChinaTripUSC , Facebook@uscinchina, or contact me at nansongh@usc.edu for any questions.